Twice in an hour emergency weather alerts buzzed and rattled our phones lying on the coffee table. 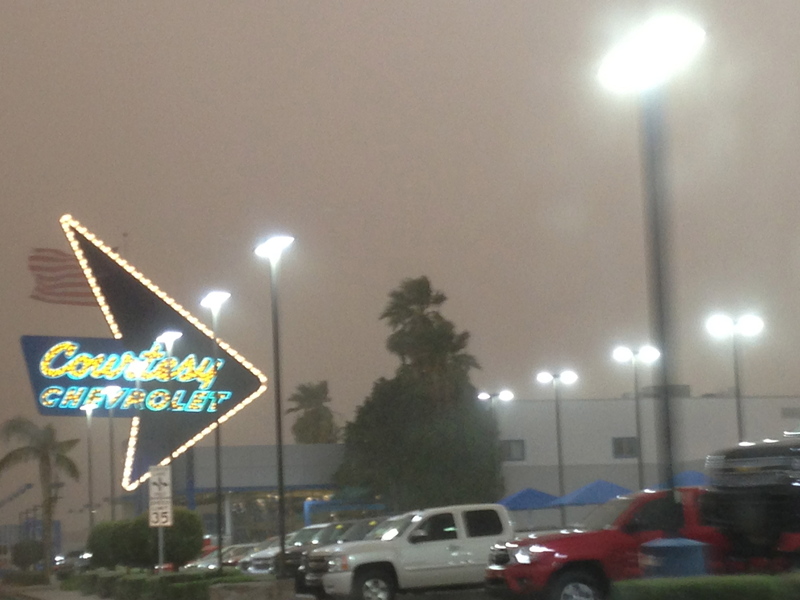 “Emergency: Dust storm approaching. 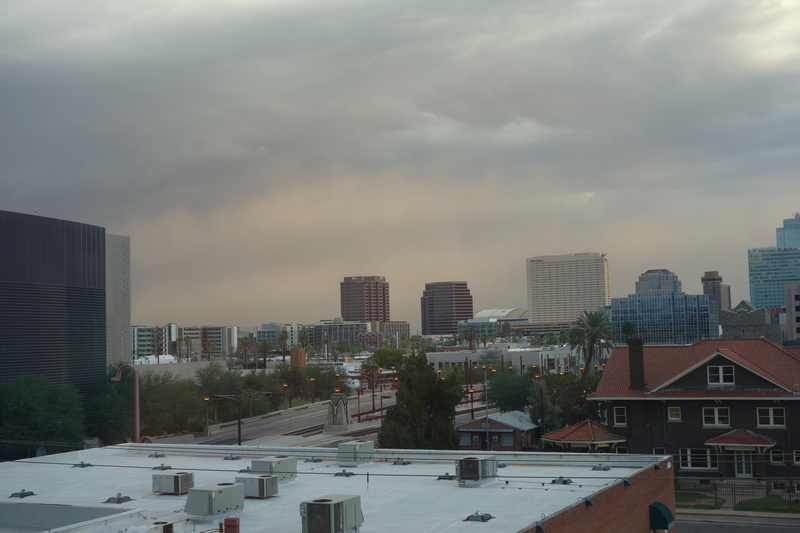 Do not travel.” We looked out Margaret’s tall south-facing windows overlooking Phoenix’s downtown. Maybe the sky looked a little pinker in the southwest corner, but, naah, nothing serious. Time to drive to dinner. I’d been looking forward for days to dining at True Foods in the Biltmore shopping. Vegetables, at last! Within the time it took us to reach the garage, the sky took on an apocalyptic hue. Our trip to the restaurant turned into a race against the dust storm that was rolling right over the city in the same direction in which we were heading. Daylight almost disappeared two hours before it was scheduled to. The high winds buffeted cars on the road from side to side. 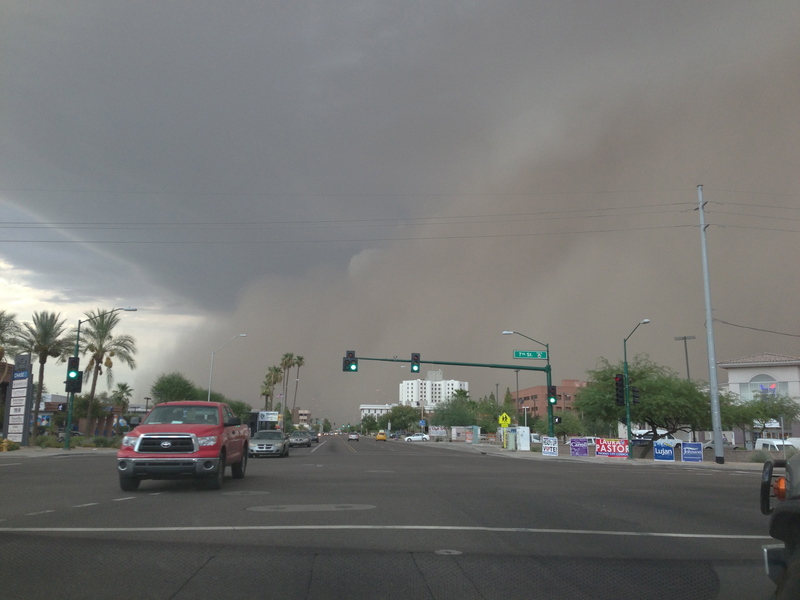 The dust beat us to the corner of Camelback and 24th. We weren’t able to get inside the restaurant before the sand started, but we missed the sheets of rain that soon followed. Capacious flashes of lightning illuminated the tawny air like klieg lights on a movie set. I swear I saw a horizontal streak of electricity whip down the length of the parking lot. An earnest waiter, speaking in a soft funereal tone, gave us his spiel about how healthy and “non-inflammatory” and adaptable the menu was to patrons with all kinds of dietary restrictions. From our table, we had a clear view of Nature’s hissy fit while we ate a scrumptious meal (a good kale-lemon-parmesan-bread crumb salad with a woodsy mushroom-taleggio thin-crusted pizza). By the time, we headed to the car, the air was clear. The True Food franchise, owned partly by the Tucson-based holistic physician Andrew Weil, has now reached southern California and Colorado. It would be nice to think they’re just teasing the healthy eaters of northern California by keeping us waiting. Tru Foods, in my humble opinion, is just okay. There are definitely better choices in our area. I agree with you. While visiting family here. they’ve take me to a few excellent restaurants in the area. But I’ve been so starved of the kind of food on offer at True Food that I relished it. It wasn’t bad at all. I’ll be in Flagstaff from Wed to Sat. While there, I’ll be eating at Tinderbox and Brix, both of which I like.